TÊTE À TÊTE WITH BELLEBARCELONE #6 : THE ONE AND ONLY ALBERT ADRIA! Today is a special day... And BelleBarcelone is 2! It has grown thanks to all of you and I have made new friends and met very interesting people during this journey. So this interview had to be special. I have met few chefs and some prominent characters till now , but I have shared a special connection with Albert. He has a small empire on Parallel with his 5 restaurants, so we have been going once in a while. And he is always there, running from one place to the other but always stopping to say hi. Unlike the other chats, (tagged informal chat on my labels above) it wasn't the 1st or 2nd time I was meeting the interviewee, so I was quite comfortable having a chat at Tickets. I was almost feeling at home. So here we go with Albert, a very humble and straight forward person, a no nonsense chef and always with 100 things to do. I don't think he sat still for more than 5 minutes. BelleBarcelone (BB): How was your tip to Mexico? New ideas for your 2 new Mexican restaurants, Hoja Santa and Niño Viejo? Albert Adria (AA): Yes I need to feel the essence of the country in my cuisine. While Niño Viejo is Mexican street food with its nachos and tacos; Hoja Santa is the haute cuisine from Mexico. It is an actual and contemporary cuisine based mainly on mole. We have just started and its shaping its essence. It is authentic. BB: You now have 5 restaurants (almost 5 with the renewal of 41 and opening of Enigma). All from different continents, while Tickets and Bodega 1900 is based in the Spanish Gastronomy, here in Europe; you have Pakta, the nikkei cuisine, Japanese and Peruvian; and the new Mexican. Nothing from the African continent, why? AA: I am not familiar with that cuisine. I can't offer something I don't know how to cook. I love Moroccan food , filled with flavors and history. It transports you elsewhere with its smells and spices. BB: Enigma will open in Spring 2015. What should we expect and what are your plans after. AA: Yes Enigma will be similar to El Bulli, with the huge space we have we will surely be able to do wonders. One day I would also love to open a vegetarian restaurant. I am a vegetable freak, I love veggies, they are filled with aromas and you can really work so well with them. As you know whenever you have come to Tickets, you have had different things each time and all vegetarian. BB: What do you feel like having at this precise time? AA: Tomatoes!! I am in love with them. BB: Is there some ingredient or something you wouldn't use in your cuisine? AA: I don't like reduction in sauces. I feel it is too dense and doesn't favor the taste of the ingredients. BB: Do you feel pressurised everyday? Do you feel the need to prove yourself? AA: Since a couple of years, I don't feel this pressure. I used to all the time. I want to live and let my cuisine create emotion.I want the client to feel while eating. BB: For you what is Modern cuisine? Is it only molecular gastronomy? AA: No not at all. Modern cuisine is based on tradition. "Lo bueno es lo que perdura". (The good is what lasts). Few privileged ones are the ones that come here and understand this. They don't need all the modern technologies to appreciate a meal. We have many visitors from all around the world but we also have an important clientèle specially at Tickets and at the Bodega. We have our fixed clients in the Bodega 1900, which is a basic vermuteria, with traditional cuisine; what we offer there is product. The product you get there is the finest and highest quality you can get. In Tickets we offer sensations, the hight quality products is brought to you with tradition and a modern spark. People uses all their senses to appreciate the meal. BB: How do you get the ideas of reinterpreting the classics? For example "bocadillo de jamon" in the way you serve it here? ( The sandwich here is served on an inflated baguette and the ham covers it). AA: As I told all comes from tradition. For example the inflated bread is an idea we borrowed form Sicily. We just served it upside down. BB: Nowadays it is common to see all the big chefs on tv. Why don't we ever see you? I am sure you must be asked to? BB: Would you like being part of a video game? AA: I am working on one at this moment. Look out for it! BB: Tell me about a special plate that has marked you very particularly? AA: There have been many, here, in Japan, but just recently i had this wonderful plate at Mugaritz. It was excellent: "Cuello de Pato". BB: How did your vocation came? How was your transition from being the pastry chef at El Bulli to the famous chef you are today? AA: I started at the age of 15. I had to work due to our economical situation, I started working in all the fields at El Bulli. That is when I realised I was allergic to crustacean. I couldn't be in the kitchen so i shifted to the pastry area. I became a pro in that area; but I always liked all the aspect of cooking. I have always been an all around chef, and in Tickets, we have a pastry chef; I don't really get to do much of it anymore. BB: Any more plan of expansion worldwide? BB: Why do you have such a big team ? Where do they get trained? ( I can personally tell you that the staff is very well prepared and give full attention to the client, you are the main protagonist there). AA: We need such a big team because we put our full dedication to food, the preparation and presentation need a lot of time. They mainly get trained here, we have a young and filled energy team. Our head chefs, have great experience from their past jobs in the restauration business. BB: If El Bulli didn't exist would you have been here today? AA( feeling nostalgic): No! Those 23 years at el Bulli have been my most precious moments. Beautiful time to cherish forever. BB: What is exactly the BulliFoundation? (after more than an hour of chatting, we ran out of time, so here is a short description, I will do a more precise post on it in sometime). AA: In Brief, it is 3 concepts: The Museum, the Bullipedia and the Bullilab. An homage to Gastronomy in capital letters! Thanks Albert! It was nice getting to know you better. THE TEAM AT WORK IN THE MORNING! THE FAIRY TALE CELING AT TICKETS SWEET CORNER! WHERE 41º USED TO BE: THE SWEET CORNER! El Cuello del Pato! in Mugaritz! 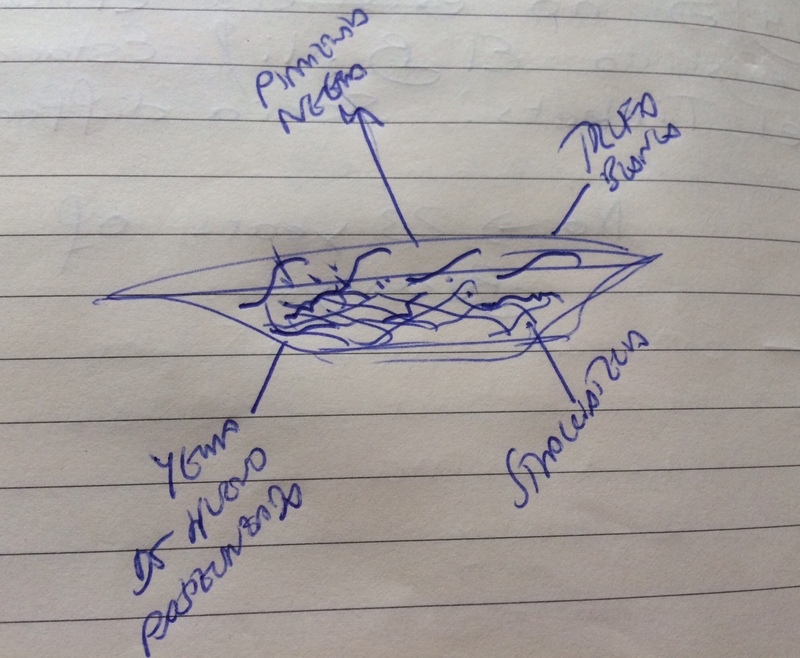 DRAWING A DISH BY ALBERT: NEXT WEEK AT TICKETS! SEEMS YUMMY: STRACIATELLA, EGG YOLK, WHITE TRUFFLE AND BLACK PEPPER!